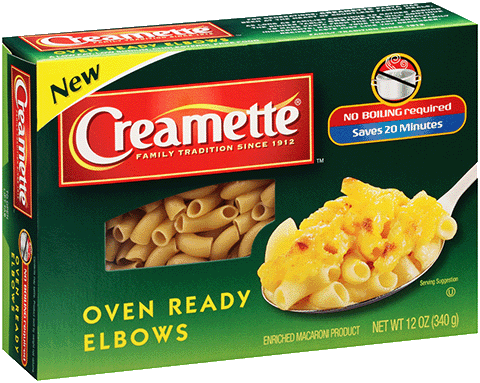 Making a casserole or baked pasta dish? 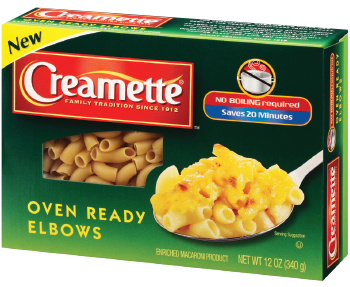 Creamette® Oven Ready Elbows makes it faster and with less clean up. With no boiling needed, this pasta cooks as it bakes in your oven dish, saving you 20 minutes of preparation time. Try the recipe on the package or, for your own recipe - all it takes is a few simple steps to create a delicious baked pasta dish: Be sure to watch our online videos for delicious recipe ideas. SEMOLINA (WHEAT), DURUM FLOUR (WHEAT), WHEAT GLUTEN, NIACIN, FERROUS SULFATE (IRON), THIAMIN MONONITRATE, RIBOFLAVIN, FOLIC ACID. CONTAINS WHEAT INGREDIENTS AND IS MANUFACTURED IN A FACILITY THAT USES EGGS.